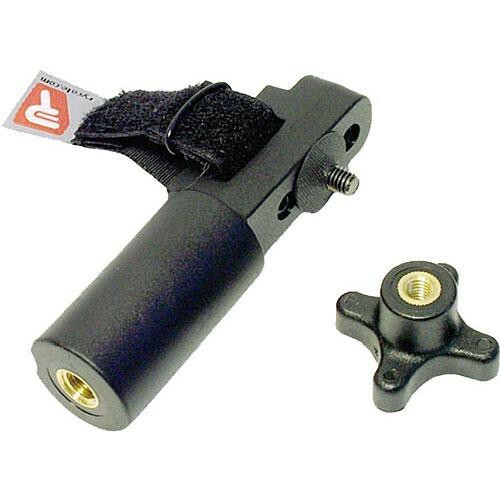 The 37304 Camera Clamp Attachment (CCA) from Rycote is a device that allows you to convert your softie mount with pistol grip into a camera clamp. The unit weighs only 1 oz and features a black finish that blends in with the aesthetics of any setup or work environment. It is constructed of Hytrel, a virtually unbreakable thermoplastic. Use this unit to convert your softie mount with pistol grip into a camera clamp. The attachment weighs only 1 oz. It is constructed of Hytrel, a virtually unbreakable thermoplastic. Box Dimensions (LxWxH) 7.0 x 4.5 x 2.0"
Could you use this to attach the Zoom H1 and insert into the camera clamp designed for a shotgun mic? Asked by: Brandon Rachel T.
Not without modification. Also, the CCA is designed to fit the Softie bracket, which has a Metric M6 bolt, whereas the Zoom H1 thread is 1/4 20.